“From September to December, our team of four practiced at least six hours a week,” says MBA candidate Elizabeth Van Dyck. DeGroote finished in third place at the recent John Molson MBA International Case Competition, besting teams from five continents. From left to right: Milena Head, Britney Hawkins, Chinomnso Nwamadi, Van Dyck, and Marley Kafato. Challengers arrived from around the world, and only one team from North America landed on the podium: The DeGroote School of Business. DeGroote MBA candidates earned an impressive third-place finish at the recent John Molson MBA International Case Competition (JMICC), held Jan. 7-11 in Montréal. The competition is one of the largest and oldest academic tournaments of its kind in the world. The not-for-profit event is organized annually by MBA students at Concordia University’s John Molson School of Business. “JMICC is widely known as the premier event for MBA case competitions. The DeGroote team worked tirelessly throughout the fall term to hone their case analysis and presentation skills with weekly practices and simulations. And all their hard work paid off,” says Milena Head, Wayne C. Fox Chair in Business Innovation, and MBA case competition coach. “This was truly an amazing accomplishment for the DeGroote team at such an intense and prestigious case competition. The world took notice of the excellence of DeGroote MBAs. I could not be more proud of them,” Head continues. This year’s tournament attracted 36 teams from Africa, Asia, Europe, the Middle East, and North and South America. Nanyang Business School (Singapore) placed first overall, while the Lund School of Economics and Management (Sweden) finished in second place. The format includes a round-robin tournament consisting of seven unpublished business cases, including a live case presentation by a major company facing a real-life business challenge. The DeGroote team consisted of Britney Hawkins, Chinomnso Nwamadi, Elizabeth Van Dyck, and Marley Kafato. Kafato also won the inaugural best presenter award at the competition. 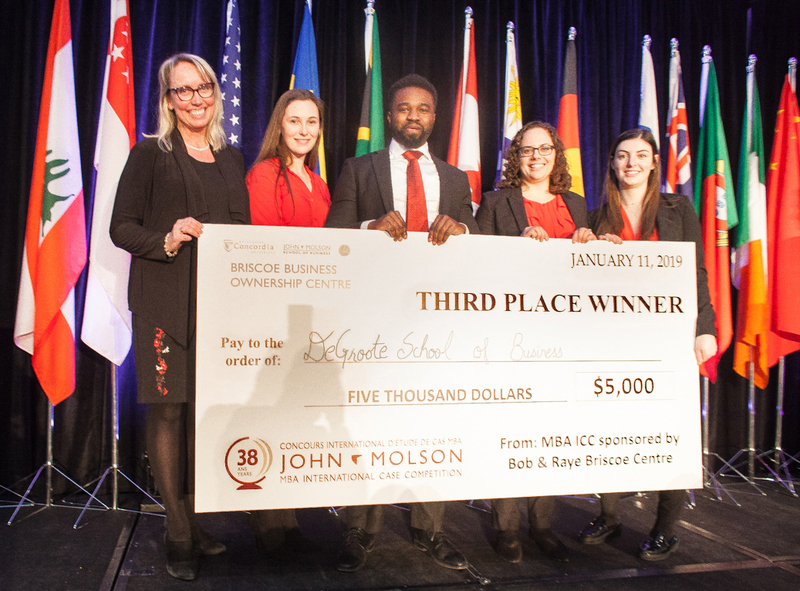 During a bitterly cold week in January, 36 teams from around the world converged in Montréal for the 38th annual John Molson MBA International Case Competition (JMICC). Teams from countries such as Brazil and South Africa traded sun and surf for the winter wonderland of Québec. The DeGroote School of Business, one of ten teams representing Canada, has competed for the past eight years under the leadership of Milena Head. The theme this year was disruption, with each case discussing how new business models and technology are changing and shaping the future. The strength of our DeGroote team was the diversity of our backgrounds and expertise, ranging from technology and finance to consumer-packaged goods and healthcare. However, I believe what truly made our presentations stand out was our stories. As we ripped open the envelopes containing the cases and pored over the pages, echoing in our heads was our team’s mantra: “What is the story?” We continually encouraged each other to think about the narrative that would ring true throughout our presentations to make them engaging and creative. At JMICC, each team has three hours to read the case, determine a solution, and design a presentation. Teams are judged not only on the soundness of their solution, but also their presentation skills. In the initial round robin, each team goes head-to-head in five cases against another team in their division, with semifinals and finals being a sixth and seventh case during the grueling five-day competition. From September to December, our team of four practiced at least six hours a week. We discussed team dynamics, memorized demographic data from around the world, and learned new analytical tools. However, all that practice and studying could not prepare us for the feeling of walking toward the preparation room of our first case, desperately hoping our smiles were big enough to hide our nerves. With no internet access allowed, we began to discuss what could be an effective solution and how to present it in a compelling way. We did so armed with no more than a handful of markers, flipchart paper, Microsoft PowerPoint and Excel, and our knowledge and skills from two years at DeGroote. As the competition progressed, I was thrilled to find out we were chosen to move on. We won our first four cases with enough bonus points to make us not only divisional leaders, but the leader of the entire competition. To ensure a position in the semifinals we needed to win our fifth competition against Brazil. Waiting on the edge of our seats for the results, we experienced ten seconds of turbulent emotions as we found out we lost to Brazil but still reached the semifinals as one of three wild cards based on total points obtained throughout the competition. Our semifinals division included Smurfit Graduate Business School (Ireland) and Memorial University (Newfoundland) – the 2018 and 2017 JMICC champions, respectively. After winning the semifinal, we progressed to the finals to compete against Nanyang and Lund. The final presentations were livestreamed around the world and presented to a live audience of fellow participants and coaches. At the end of the presentations, as we shook hands and congratulated the other finalists, everyone wondered who was going to win the championship. That evening, at the final banquet, the results were announced: Nanyang first, Lund second, and DeGroote third. In addition to ranking first in the western hemisphere, one of our team members, Marley Kafato, received the inaugural award for best presenter. I was honoured to be a member of the 2019 JMICC team. It was a personal capstone of my MBA, a chance for us to prove to ourselves and to the business community what we had learned throughout our time at DeGroote. As proud as I am of our international third-place finish, what is of even more value to me were the encouraging texts and emails that we all returned to on our phones when friends, classmates, and alumni found out we were in the finals. Many of them shared the experience with us by watching the livestream and sending messages. Their support points to the true value of a DeGroote MBA: The friendships and relationships we gain from the program.